If you are going to buy a pair finger save goalkeeper glovesand you cannot make a fist. Please DO NOT buy! Just imaging punching someone with an open hand!!! You will probably break your fingers. And this is what can happen if you pick the wrong type of fingersave goalie glove. I have seen this soooo many times over the years, young keepers wearing these gloves and the gloves are that rigid they can only close their hands by 50%. This is very very dangerous. Imagine a cross coming over and a keeper punching the ball with all his or her strength, the chances are they are going to do some serious damage because they are technically striking with an open hand. This is bad. 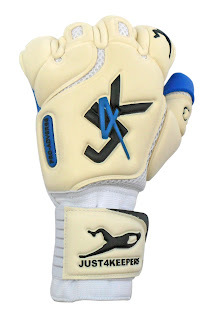 Over my years as an international goalkeeper coach and founder of Just4keepers goalkeeper training schools, I have actually seen several of my students break their fingers because their fingersaves were too tight. Finger savers can be a great glove BUT only when you get the correct ones were you can make a fist. Last point, it is also worthwhile NOT buying the finger protected gloves that are cheap. Pay a bit more for this type of glove and you should be ok. But remember; before you buy make sure you can make a fist!